We’d love your help. Let us know what’s wrong with this preview of The Alpha Plague 7 by Michael Robertson. Flynn Golding has lost all of the people close to him. His mum, his dad, and now Vicky. However, he doesn’t yet know Vicky’s dead, so he doesn’t know who killed her. Convinced that Vicky chose to leave, he’ll find out the truth sooner or later. When he does, he’ll have to accept his community is run by her murderers. The community that offers him safety, security, and thre Flynn Golding has lost all of the people close to him. His mum, his dad, and now Vicky. However, he doesn’t yet know Vicky’s dead, so he doesn’t know who killed her. Convinced that Vicky chose to leave, he’ll find out the truth sooner or later. When he does, he’ll have to accept his community is run by her murderers. The community that offers him safety, security, and three square meals a day. Either that, or he’ll have to make them pay, therefore giving up his safe existence and re-entering a hostile world. To ask other readers questions about The Alpha Plague 7, please sign up. Are YOU Ready For The Zombie Attack?! This action packed British urban fantasy follows a tight cast of characters through a rage-style zombie apocalypse. Organized into trilogies, the opening trilogy details the hourly spread of the apocalyptic pandemic from the POV of a father just trying to save his 6 y.o. son, Flynn. The second trilogy jumped ten years to show the dystopian micro-communities that existed in the ravaged landscape. Each micro-community was largely isolationist since infected zombies ruled the world. This installment This action packed British urban fantasy follows a tight cast of characters through a rage-style zombie apocalypse. Organized into trilogies, the opening trilogy details the hourly spread of the apocalyptic pandemic from the POV of a father just trying to save his 6 y.o. son, Flynn. The second trilogy jumped ten years to show the dystopian micro-communities that existed in the ravaged landscape. Each micro-community was largely isolationist since infected zombies ruled the world. This installment repeats the trick of the fourth book by fast forwarding yet another ten years--again to shocking effect. Here, the zombies died out 8 years prior. So everything's good, right? And, no. Dystopian and sadistic micro-communities still dominate the countryside, but now unchecked by the undead. With dwindling resources, communities enslave or outright kill each other. Others turn to cannibalism. The nice sub-theme of this installment is trust. Flynn didn't trust Vicky during his teen years, and then she left. Then he didn't trust the new leaders of Home. Unless he wants to go it alone forever, he needs to learn to trust. But who to trust when it's every person for oneself . . . to the death.?? 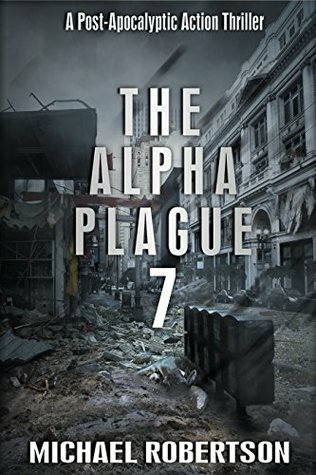 I've read all the books so far in the Alpha Plague Series and I've found them to be well written, with interesting characters and fast-paced storytelling. Definitely a good read although I found this particular book to be a bit gruesome. I guess I prefer my gore a little less gory. Like the six books before, this book leaves you wanting more. I found I couldn't put it down and read it in 24hours! Even though Vicky has gone the book has the same feel and Flynn takes over as the main character. The journey continues.... Can't wait till book 8! An excellent addition to the ongoing story. I thoroughly enjoyed this installment to the series. It continues on from the previous book and continues developing the story of Flynn. I'm looking forward to the next book. I really like the series but I really despise the main character. He's more than plausible but combines the worst of teenaged self-righteousness with no acceptance of responsibility or gratitude. This is a mid-twenties male, not a child though he thinks like one. He seems a good model of what to avoid in oneself. The characters are brutal and real with a lot of gory detail. The series background is composed of three sets of survivors. The first are the end of the world maniacs whose sole purpose is to pillage and destroy any pocket of normality they encounter. How they will survive when they are all that's left, is a great question. The second set are the devolved who have burnt out any concept of building, growing or rediscovery and routinely practice cannibalism. They roam the countryside without plan or purpose except to eat whatever or whomever they encounter if it's not too difficult. The third set are the timid who look the other way when they discover their insane neighbors practising slavery, murder, etc. imagining that they are superior and also won't be next, if they don't disturb the neighbors. They tell themselves that cowardice is civility and the horrors visited on others is not their responsibility. This series has been great. Flynn is a survivor. With loss of his step mother and parents to deal, and him finding his new love, I can't wait to read the last book in this series. Very good book. I went through this one faster than the last one Alpha 6. It kept me going from page to page. I thought the story line was very good and kept me interested throughout the story. Cant wait for the next one. A very good storyline. I'm still really interested in what happens. Really looking forward to the next chapter of this story.